Happy Monday, y’all! It’s the first day of school here in our area of the Sunshine State, hard to believe it’s that time again already. We’ve got a fun organic tangle to explore today, Dinoflor is from Pennsylvania CZT Suzanne Fluhr and it’s her 4th tangle on the site. When constructing the Dinoflor “tree”, it’s important to keep in mind that for the final step, you will want to have “V”s where the “stems” join. So, if you add one “stem”, add a complimentary one. The lengths of the stems should vary. There is no set amount of auras for the “leaves” nor for the “V” fillers. Suzanne illustrates the step-by-step instructions for drawing Dinoflor here on her blog where she features it in two Zentangle® tiles as well as in two ZIAs. Check out the tag suzannef for more of Suzanne’s tangles on TanglePatterns.com. 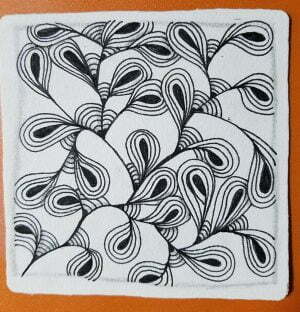 Wow Suzanne this is a great tangle, love it immediately and the tiles you show us, look gorgeous!!! This tangle is such a treasure !!! Thank you to Linda for sharing Dinoflor and for your comments, Ria and Margaret. I hope everyone finds it a relaxing and fun tangle. I like this very much. I can see myself using it often.